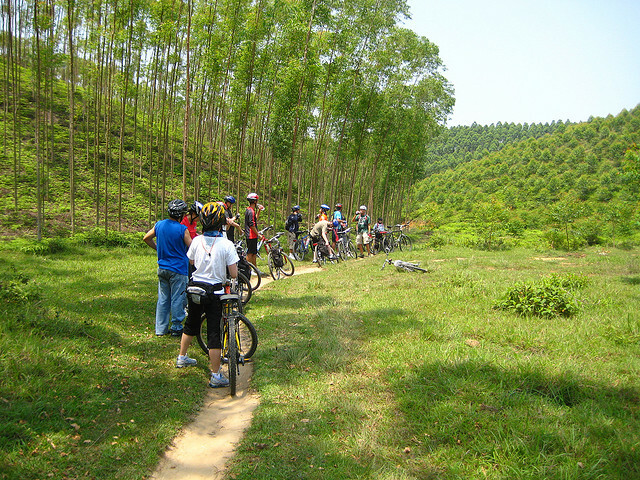 Cycling in the countryside has become an increasingly popular respite from Chinese city life. Photo by David Woo. Cycling is gaining popularity in China, with this year’s Trek bike sales topping 100 million yuan (US$15.6 million), from just 2 million yuan in 2006. General Motors signed a deal to include its vehicles in RelayRides car sharing services, currently located in Boston and San Francisco. The Asia Pacific Automotive Conference and Expo 2011 was held this week in Chennai, India. Delhi government officials announced the Delhi Transport Corporation (DTC) will equip all of its bus shelters with Passenger Information Systems (PIS) within the next year. The three-day 7th International Congress on Sustainable Transport, hosted by EMBARQ’s Center for Sustainable Transport in Mexico (CTS-México), was held in Mexico City this week. World Habitat Day 2011 was celebrated on Monday in locations around the world. The event serves as a reminder to reflect on the state of our towns and cities, and the basic human right of adequate shelter. Mayor Bloomberg announced on Wednesday a new deal that could give New York City the money needed to complete the Manhattan Greenway. Walk21 hosted its 12th international conference this week in Vancouver, Canada, with the aim of developing healthy, sustainable and efficient communities through walking. The Sustainable Development in Naya Raipur conference last week explored the challenges and solutions facing the construction and management of surrounding Indian towns. Paris launched the Autolib fully-electric car sharing outfit. Officials hope to have around 5,000 “Bluecars” in the program by 2013. The World Resources Institute launched two new GHG Protocol (GHGP) standards for corporations to use in their accounting and reporting of greenhouse gas emissions. Boise, Idaho began its first car sharing program, with the hope that it will encourage individuals to transition from personal vehicles to mass transit transport options. The U.S. Supreme Court affirmed the right of a California pollution-control agency to charge developers for building projects that are expected to induce large driving demands. The city of Chicago passed a ban on both talking on the phone and texting while cycling. Breachers of the ban face graduated fines starting at $20. Human error was the cause of last week’s subway crash in Shanghai, responsible for injuring more than 290 people, the New China News Agency reports. In an effort to reduce distracted driving and boost roadway safety, the AAA Foundation for Traffic Safety and AAA pronounced the week of October 2-8 as Heads-Up Driving Week. The European Parliament today adopted a resolution strongly recommending the proper authorities throughout Europe to instate a maximum speed limit of 30 kilometers per hour in all residential areas and urban areas not containing separated cycle lanes. As part of the Rail-Volution conference in Washington, D.C. on October 16-19, a transport short film festival will be held on the evening of the 17th. Cleveland, Ohio’s RTA transit agency is showcased in a video created for Siemens’ Changing Your City for the Better Contest, highlighting the city’s new $500 million bus rapid transit (BRT) line. Ten miles of Los Angeles city street will be made car-free this Sunday for CicLAvia. Ciclovías began over thirty years ago in Bogotá, Colombia in response to the congestion and pollution of city streets.